garlic and ginger with a couple of pinches of salt for 10 minutes over a low heat or until softened, stirring every so often. Heat the oven to 200°C/180°C fan/gas 6. Stir in the chilli flakes, passata/tomatoes, sliced olives, sun-dried tomatoes, dried and fresh herbs, a squeeze of lemon juice and the sugar. Season to taste with salt and black pepper. Leave to simmer over a low heat for 10 minutes. Check the seasoning once more, adding more lemon and salt and black pepper as required (don’t over-salt the dish as the feta will be salty). 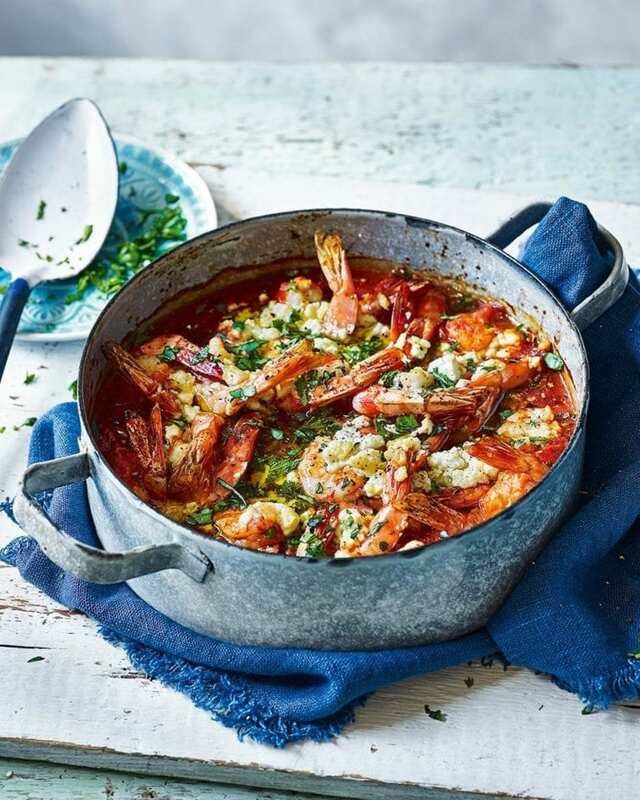 Nestle the prawns on top of the sauce, crumble over the feta and drizzle with the remaining olive oil, then bake for 12-15 minutes until the prawns are cooked through and the feta is tinged golden brown. Scatter with the reserved herbs and add another grind of black pepper to serve. If you like, add queen scallops and squid rings to the prawns. Use straight from frozen or defrost in the fridge or under cold running water in the sink. Make the tomato sauce up to the end of step 1, then cover and chill for up to a day. Put in the oven to warm through before adding the prawns, then continue with the recipe. Cheaper feta is aged in salt water in airtight steel tins. Barrel-aged feta is stored for at least 3 months in wooden barrels. These allow the air to permeate as the cheese matures with help from the natural bacteria and yeasts from the wood. This gives the feta a creamy texture and rounded but punchy taste. Chill a light and citrussy southern French picpoul de pinet.